You probably won’t see this preferences pane much, but pretty much everything in Mountain Lion ties into the iCloud. 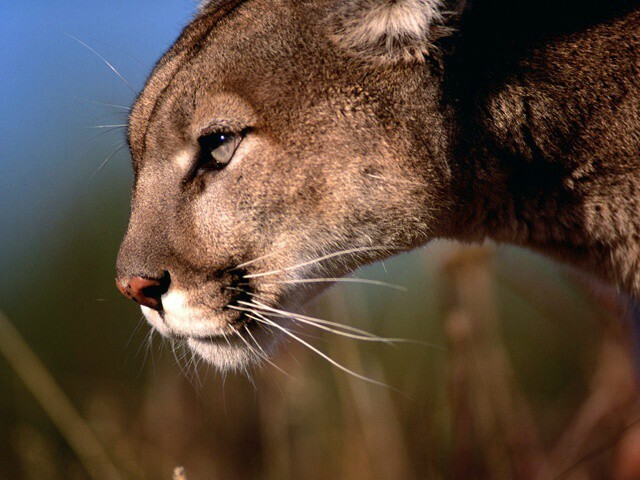 If the goal of Lion was to bring iOS’s best features to OS X, the goal of Mountain Lion is to let your iPhone, iPad and iPod touch talk with each other seamlessly, without manual syncing or file management. iCloud is now injected into the very DNA of OS X. It just works. Apple has tried this before in the past, most notably with their recently shuttered, subscription-only MobileMe service. While mimicking much of the same functionality as MobileMe, though, iCloud is now injected into the very DNA of OS X. iCloud just works, and everyone with an Apple ID has one, no subscription required (although you can pay for more space). Using iCloud, all of your photos, your contacts, your calendar items, your reminders, your emails, your notes, your browser history and your (iCloud-only) documents and data are automatically synced with Apple’s servers. It’s that simple. 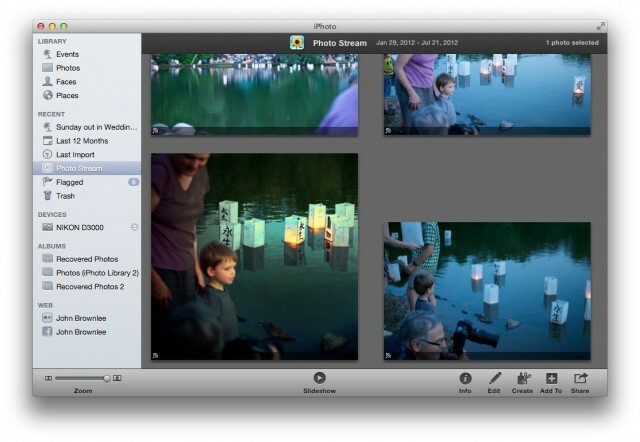 If you take a lot of pictures across multiple devices, Photo Stream is one of the best features of iCloud. There are privacy concerns with allowing a company to have access to all of your data, but for most customers, the benefits of iCloud will far outweigh the drawbacks. Even on a single Mac, having your data synced means that if your machine goes belly up without a recent back-up, you can restore most of your most important data to a new machine without a fuss. As long as you have iCloud turned on, those photos of your newborn son, or your business calendar for the next year, or your address book are safe. There are privacy concerns with allowing Apple to have access to all of your dfata, but for most customers, iCloud’s benefits will outweigh the drawbacks. It’s when you have multiple Macs or iOS devices, though, that the iCloud really shines. Under Mountain Lion, the iCloud will remember if you’ve, say, read an email on your iPhone, or added a new contact on your iPad, and automatically sync your devices accordingly. Likewise, if you load photos from your SLR on your Mac, they’ll be available through Photo Stream on your iPad for some Snapseed or PhotoShop Touch action. And you can set yourself Reminders on your Mac to, say, buy milk when you arrive at your local grocery store, and have your iPhone automatically alert you when you do the shopping. From a practical perspective, it all works without a hitch, although it can sometimes be frustrating having to wait for your system to sync with the latest iCloud data: for example, if it’s been a while since your Mac has synced your Photo Stream. 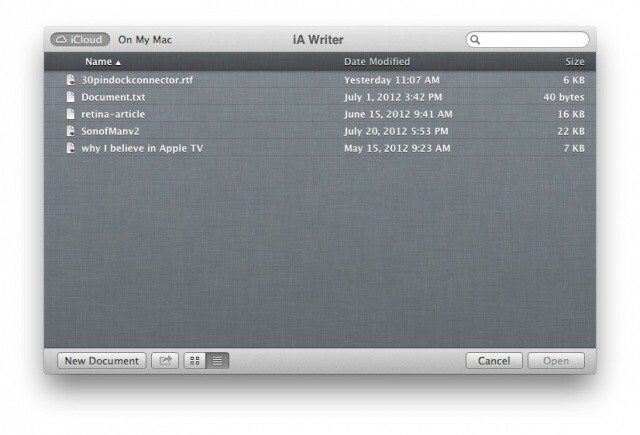 Documents stored in the Cloud, as viewed using the excellent text editing app, iA Writer. For most users, the most confusing aspect of iCloud is probably going to be Documents in the Cloud, which only works in apps that have been specifically updated to support it, like Apple’s iWork suite or third-party apps like iA Writer. Unfortunately, once you save a document to the iCloud, there’s no easy way to browse through your files outside of the app you saved it in, nor is there an easy way to, say, drag documents you’d like to keep synced into the iCloud from your desktop into a Dropbox or iDisk-style “syncing” folder. It’s easy to see why Apple is doing it this way — Apple has been trying to get rid of the traditional desktop file system for years now, and Documents in the Cloud is the way they eventually plan to do it — but right now, Documents in the Cloud feels a little ephemeral. Even in Apple’s core apps, not enough software supports Documents in the Cloud, and for most users, it’s going to feel a lot more limited than signing up for a free Dropbox account, even across multiple Macs and iOS devices. iCloud is what MobileMe should have been from the beginning, and it’s an integral part of Mountain Lion weaving seamlessly through the vast majority of apps. Documents in the Cloud isn’t quite there yet, and we could wish that Apple’s interpretation was more friendly to Dropbox-style power users, but we imagine this part of the service will become more useful over time as apps (including Apple’s own) update themselves to support the feature. 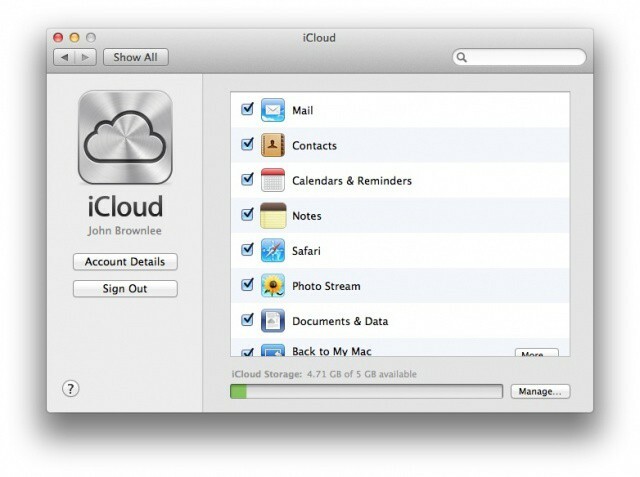 iCloud is what Mobile Me should have been from the beginning, and it’s an integral part of Mountain Lion weaving seamlessly through the vast majority of apps.